The EGit and JGit teams are happy to announce the 2.0 release in time for the Eclipse Juno release. 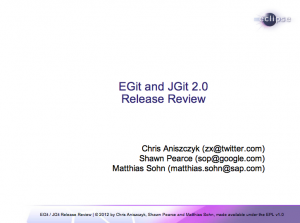 Check out the respective JGit New and Noteworthy and EGit New and Noteworthy documents to see what’s new. In the end, it’s great to see 64% of the projects released on the Juno release to use Git, we’ve come a long way. I’m hoping that after the dust settles from the simultaneous release, the remaining projects can focus on migrating to Git. For now, enjoy Juno and improved Git tooling support!